It is useful to take our intuitive understanding of inertia and apply it to fields where our intuition might deceive us, in this case organisational change. 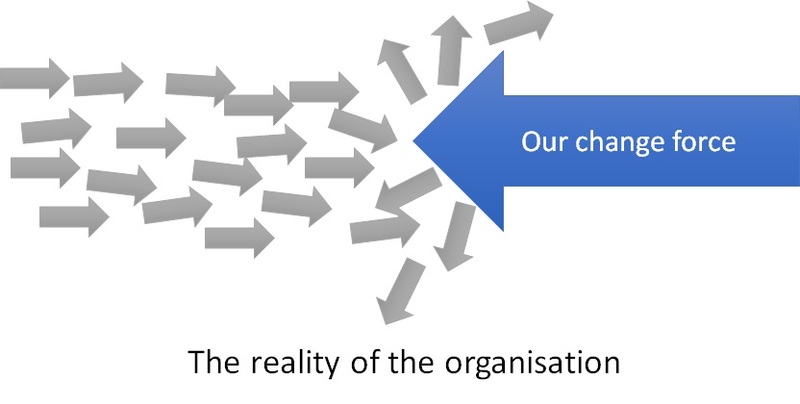 Let’s look at our “bodies in motion”: the organisation. If we sample the population of an average organisation we are likely to see a minority who are extremely content with their position, a large spread who are mostly content but with some gripes, with the tail end of this spreading to general discontent and into active discontent. Some companies will be weighted at the head-end, some further towards the tail. Crucially, however, is that even when they are discontent , the majority of people will attribute this to external forces: e.g. they believe their skills are not harnessed, and not to themselves a the source of their current predicament. Why is this important? It’s important because the overwhelming majority of people in an organisations will have a strong belief that their current trajectory is fundamentally ‘right’ (even if they are being frustrated by outside influence). In other words, the decisions they took to get to this point contributed to a person heading in the right direction, or at least made the best of a bad lot. They’re belief is that they’ve made the right choices, generally. So what does this mean for a change management analyst? The instinctive reaction is to interpret the organisation as a single object, like a ship heading towards the rocks. So the thinking goes that if enough force can be applied to that object, it can be stopped and turned around somehow. The problem is then reduced to “getting a big enough force to stop this object”, and this is indeed how many in leadership positions will interpret the problem. This simple idea is reflected below. We apply our thinking and aside from the crunch from the organisation’s inertia meeting the change force, we imagine that if we have enough force, we’ll stop the ship and turn it around. Burning platform messages are utilised; leaders speak in emotive terms about the need (again) to step forward; messages are honed; time and effort poured into creating logos for projects, graphics for presentations. And yet the outcome is usually pretty underwhelming. We’ve actually caused a lot of problems. Some of our team will align to the new way of working. Others will have merely been mildly diverted from their original direction and will quickly get back to doing things in the way they always had done. Still others will be diverted so far off course that they will cease to function in a constructive manner (leaving the company, destructive actions, sick leave and stress leave). With time we can regain the alignment required, but there is a better way. Visit www.newmanagement-consulting.com to learn more.